The 2014 attacks on Gaza killed more than 2,000 Palestinians and injured 11,000, leaving approximately 900 with permanent disabilities. 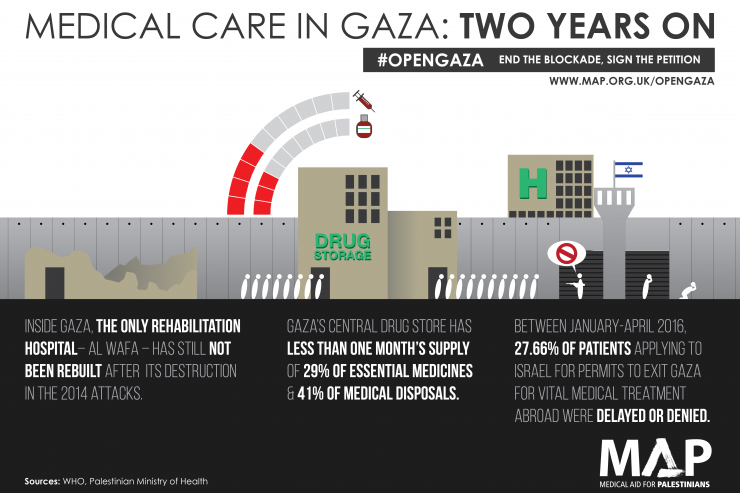 As our latest infographic shows, needing to access care after the conflict struggle to do so due to the nine-year blockade and closure of Gaza, and the damage caused to Gaza’s health sector in 2014. During the attacks 17 hospitals, 56 primary health clinics, and 45 ambulances were damaged or destroyed, and 16 medical workers lost their lives while on duty.Last year, we partnered with the Al Mezan Center for Human Rights in Gaza and Lawyers for Palestinian Human Rights to highlight some of these cases in our ‘No More Impunity: Gaza’s Health Sector Under Attack‘ report, and called for thorough, independent investigation into potential violations of international humanitarian law. This year, we have revisited the victims and survivors of these attacks, to ask how the lack of accountability or access to justice has affected their lives. 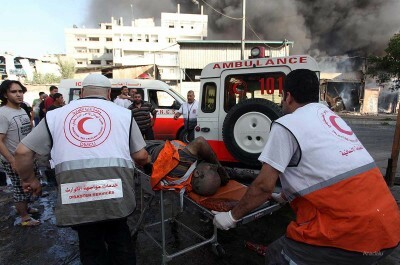 Last month, the UN Office for the Coordination of Humanitarian Affairs (UN OCHA) highlighted the continuing challenges for Gaza’s health system, including shortages of medicines and long waiting lists for surgeries caused by operating room personnel shortages. Their report also found that progress made in rehabilitating damaged health infrastructure. All of the damaged facilities have been or are in the process of being rehabilitated, though the Al Wafa Hospital – featured in our report – has not been rebuilt. Medical Aid for Palestinians has joined with 42 other aid and faith organisations to call for an end to the blockade and closure of Gaza.